A first of a kind mixer machine logically designed for mixing foam concrete applications. The exclusive Design helps in high production yield through quick Mixing procedures and reduces foam concrete from a low as 400 kg/m3 to 1200 kg/m3 Densities. The sensible design of the machine enables low maintenance cost and is very easy to install. Price range :- Rs 25000 to 18,00,000. 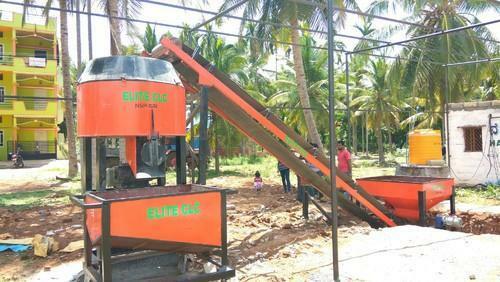 It was all started in the year of 2012 when We had decided to setup CLC blocks making plant in Chennai. Our attempt to produce quality standard CLC blocks was evading us for next 2 years, only to discover the fact that there were no equipment and machinery exclusively designed for Foam Concrete applications. The next two years we had put our blood, sweat and labor in developing a solution especially for CLC production. Today, with the help of like minded people in this industry and few good clients who supported us in our attempt, We had created a niche for ourselves as a premier solution provider of Cellular Lightweight Concrete applications. To be precise, we are bound to offer solutions to actual CLC Manufacturing which includes all applications starting from Block making, wall casting, Infill applications, compound walls, sunken filling, water proofing, land filling and much more. Every applications needs proper mixture and works at unique densities. We have patented a machine which can be unitedly used to manufacture CLC at densities ranging from 400 till 1200. 0.5 Cubic meter takes 46 seconds to mix completely.